Why Save Your Own Seed? "You have the freedom to use OSSI-Pledged seeds in any way you choose. In return, you pledge not to restrict others' use of these seeds or their derivatives by patents or other means, and to include this pledge with any transfer of these seeds or their derivatives." We've want varieties that are really tasty, as well as productive. Peas are sown in spring - they're pretty hardy, and we sow our first ones in modules in a cold greenhouse in February , planting them out as soon as they're an inch or so high (if you sow outdoors, mice tend to steal the seed). In mild areas, you can sow hardier varieties in autumn for early crops the next year, though we've found that a spring sowing usually catches up and crops only a little later. Tall peas are are a little more work in that you need to provide supports,but you get a much, much bigger yield from a given space. Beware that some of the older varieties will grow to 6 foot plus in fertile soil! A favourite from our 2011 trials, this is a first-early variety from the Czech Republic. Dwarf plants about 3 ft tall that make extremely sweet peas right at the start of the season. It has nice dark healthy foliage and bears a decent number of pods. You'll want to grow some other peas as well, for its so early that it finishes by the start of summer, but it is great for delicious peas before any others crop. It really stands out in terms of how quickly it makes peas, and has a great taste as well - both fresh and cooked. An excellent short pea to about 3ft, this is an old heirloom. It's a traditional early variety that we have chosen because as well as being early and productive, the peas hold well - they stay sweet for a long time on the plant if you don't get round to picking them. Very high sugar levels. Ready a few days later than Oskar, but still very quick to crop. A good main-crop pea, with a sweet flavor. Now extremely rare, this variety first received the prestigious Award of Merit from the Royal Horticultural Society back in 1899. Brought back into circulation by our friends at the A P Whaley Seed Co.
Our “Charmette” was first given to us by Andrew and Sarah of the Seed Ambassadors Project. We loved it the first time we grew it but it has taken several years to get it into the catalogue. Here it is now - a truly gourmet ‘petit pois’ type of pea , making huge numbers of pods crammed full of very tender little peas, meant to be picked young and cooking only lightly. Exceptionally tender and well-flavoured. This ‘charming’ variety needs little or no support if grown in double rows as the plants only grow to around 2ft tall. Quick growing gourmet pea, very rare, about to be discontinued. 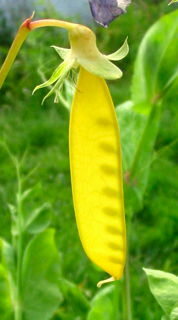 A traditional climbing pea, to 1.5 m high, with curved pods full of fat green peas. The name is from the French for a special type of pruning knife, reflecting the remarkable sickle-shape of the pods! Classed as ‘semi - early’ this makes a good second-early or maincrop pea. It has smooth (rather than wrinkled) seeds, so it can be sown early without risk of rot, but pick small for sweetness. Fast growing, curved pods, slightly flattened sweet peas. Seed grown for us in Pembrokeshire. A very unusual heirloom from Sweden, withs beautiful red/pink flowers borne in 'crowns' above the foliage. It grows to around 4 - 5 foot tall, and looks stunning on a wigwam or peasticks for a decorative feature that also produces lots of tasty peas. Given to us by Vivi Logan, we are delighted to add this to our collection. Grown for us by Daniel Blackburn in Pembrokeshire. 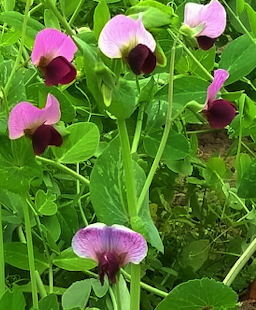 A well known and much loved tall pea - six foot plus - that we recommend as an early-maincrop pea. It hasn't really changed from the description of 'Carter's Telephone Pea' in Vilmorin's famous book of 1885 on vegetable gardening. 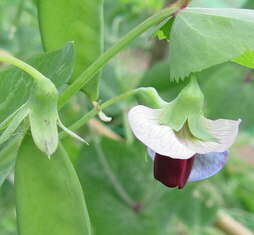 It has heavy yields of large pods with sweet, non-starchy peas inside. We find that the pods always swell up a bit before the peas fill out, so don't be fooled into picking too early! We find it's best to check a couple of pods first before picking lots - not too much of a hardship! Wrinkled seed, stays sweet longer in pods - but don't sow in cold wet conditions. Medium tall vine, use as maincrop. (And yes, we checked: the word 'telephon' (without the e) was in use by 1854 and the first patent was in 1876 by Bell, although his work was preceded by several other people. The real question is, of course, why should Carter want to call his pea after an effect first noticed when people were given electro-shock therapy in 1846? (their screams were transmitted over the wires they were holding). . . . They are a very good pea nonetheless! Re-introduced by us in 2010. The conclusion of a 4-year rescue project, here is your chance to grow a traditional UK variety that has been commercially extinct for years. A really good, traditional tall pea to 8 - 10 ft, dating from the 1840's. But it was unavailable, other than seedbanks, for a long time. 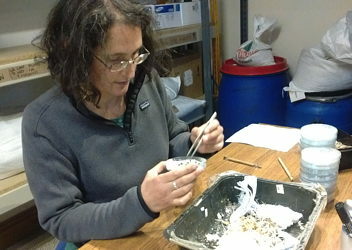 A few people sent us small samples of seed from time to time, but we couldn't get them to grow. All that changed though when Robert Woodbridge got in touch with family-saved seed from Lincolnshire in the 1940's. It grew really well, and more importantly, was true to the old descriptions. It was fantastic - the only reason tall peas have been abandoned commercially is that you can't harvest them with machines. But for home gardeners, they give a great return for a small space. So, after a few seasons, we have bulked it up from his original handful, and it available for you to try. We think you'll like it just as much as we do. I am going to send you some seeds of a Pea called Champion of England, my grandmother grew it in her very large garden in the village of Pickworth Lincs, I promised that I would always grow it and keep it going. She got the seed from the head gardener at a big country house during the war where my grandfather worked as a carpenter repairing wooden greenhouses and cold frames. As to the pea it grows to ten foot high and the peas are 8 to 10 per pod and you start picking from the bottom and work your way up, it prefers to be sown at the end of April to avoid the pea moth maggot and takes about 100 days to reach 10 ft.
An amazing find- the genuine tall strain, well maintained over the years, and we even know the location it came from. Robert's grandmother would have been pleased to know her seeds have saved this variety for gardeners everywhere. Practically extinct, other than this harvest - hence the smaller packet. But 80 seeds should be plenty to be honest, as it is really productive. And as it is (like all our seeds) real seed - not a hybrid - you can of course keep your own seed for resowing. "I just wanted to say how magnificent your Champion of England peas are – they are going off like a rocket in my garden, so vigorous and healthy with their massive leaves, already up to 75cm even here in Yorkshire and having been planted straight into the soil. They are knocking the Hurst Green Shaft into a cocked hat and I wish I’d planted them on the allotment to impress everyone instead of in the garden where only I can see them!" Another variety we rescued - a fantastic traditional UK pea that is sadly commercially extinct, but we managed to regenerate it starting with just a tiny handful of peas which we tracked down in a private seed collection in USA. So here you are, a wonderful old pea brought back from the verge of extinction. It grows to about 5 or 6 ft tall, and the special thing about Lord Leicester is that starts to flower very early on, but carries on to almost the end of the season - so you get peas over a long period. The yield is good too - just look at all those pods in the picture! As far as we know, this is extinct, other than our crop - hence the smaller packet. But 80 seeds should be plenty to be honest, as it is really productive. And as it is (like all our seeds) real seed - not a hybrid - you can of course keep your own seed for resowing. We are absolutely delighted to have Magnum Bonum available again this year, grown here in Pembrokeshire by Daniel Blackburn. The really notable thing about this variety is its fantastic flavour. It is somewhat later to flower and produce pods than our other tall peas - you'll need to wait 2-3 weeks longer to get your crop. But it is very much worth the wait - the peas are sweet, but also have a really outstanding taste. We suspect you'll eat most of your crop raw before they even leave the garden! If you like it, DO save your own seed, as we are unlikely to be able to grow seed every year. Small packet due to limited stock - but saving your own pea seed is very easy (they don't cross) and we supply full instructions, so if you set aside a small number of plants you can then have unlimited supplies in future years! 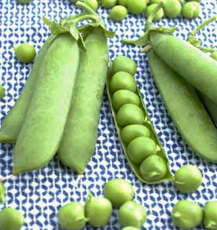 Mange-tout peas are delicious; they are grown for the flat pods that are picked immature before the peas are fully developed. 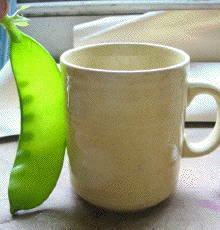 This is a beautiful yellow podded pea that is very sweet eaten fresh or cooked. A rare variety, so do keep your own seed if you like it. We have grown many mange-tout peas (if you've not tried them, you eat the wide flat pods) over the years but this one has always stood out head and shoulders above the others. 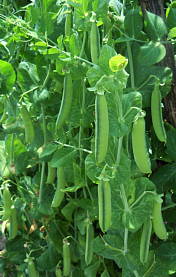 It is a superb mange-tout pea, with beautiful yellow pods, tall productive vines, and a delicious crisp flavour. The flowers are purple, & the pods are a wonderful lemon yellow colour, so we actually grow it in our front garden as a decoration! The yellow pods easy to see for picking, and great both raw in salads, or cooked as a vegetable. 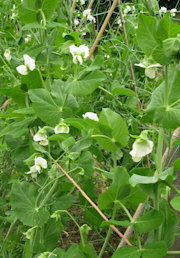 Feedback: Clare Maple, via email: "We are currently growing a crop of these peas. Our neighbour, himself a traditional gardener but always open to new stuff, was interested in them. We all shared a few, fresh off the plant, and agreed that they are probably the best tasting peas we have ever had." This sort of pea - real old fashioned Giant Sugar Peas with 7 inch edible pods - used to be very popular but are now almost completely extinct. The huge pods (the peas inside the pod in the photo are full-size) are sweet and juicy, and children just munch them straight off the plant. After a 5 year project starting with a handful of peas found in a jar in a cellar, this is our reintroduction of a proper Giant Sugar Pea as used to be grown in the 1880’s. It matches the original description and engravings perfectly, even down to the pattern on the seeds and the number of seeds per gram. We hope you enjoy it! You eat the whole pod raw or cooked. They're sweet and tender - & so huge that just a few pods are enough for salad or supper. We've had really good feedback about Bijou since re-introducing it, with several people saying they would only grow this variety from now on. Very rare, practically extinct. The pods are so big they're just silly. 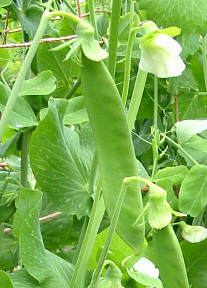 Sugar-snap peas are grown for their sugary, fat, edible pods - picked mature and eaten pod, peas and all. 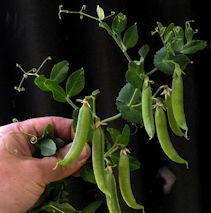 New for 2019 we have this short pea plant that needs no supports yet produces large numbers of very fat sweet juicy pods that you eat whole. They are delicious either raw or cooked and we couldn't resist eating all the trial peas! 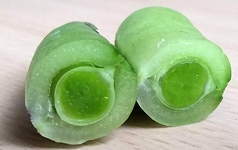 Here's a cross-section of the pods to show just how fat and succulent they are . 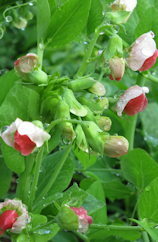 . .
A real show-stopper, this snap pea - for eating the fat pods whole - has a beautiful pink-red blush to each pod, and also makes delicate tendrils for eating. The plants grow to 5-6’ plants and are very productive. As well as eating the peas, we love putting these great tasting tendrils into salads. Bred by Alan Kapuler of Peace Seeds, Spring Blush is still throwing the occasional all-green podded plants. If you save your own seed, try to select only plants that have the pink blushed pods. 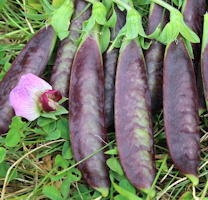 The elusive properly-purple-podded snap pea! The tall plants are purple all around, with magenta flowers and deep purple pods. Hyper tendrils for extra grip. Sent to us by Owen Bridge of Annapolis Seeds, we are now reselecting particularly good plants for mass production in 2020; for now just a few packets of our breeding stock are available. Named by breeder Alan Kapuler PhD after the Grateful Dead song from the 1970 album 'American Beauty'. Let's be clear - 'soup peas' are for use dried. They're not good fresh (far too starchy!) so you'll need to grow some normal peas too. But they do make a fantastic ingredient in soups, stews, curries and other pulse dishes. If you want a high-protein crop that can be easily grown and dried in UK conditions, then this is the one for you. A productive soup pea from the Clydach valley in Wales. We haven't been able to trace much of its history, but have been impressed with its performance, particularly the extremely difficult summer of 2012. This variety has smooth greeny-grey seeds, that make a traditional UK style pea soup or tasty mushy peas (if you prefer a darker coloured pea, look at the Latvian variety below). Allow for growth to 6 foot plus, so make frames for them as you would runner beans or climbing french beans. This is a small starter pack of 60 seeds for you to multiply and help preserve this variety. Pea seedsaving is very easy, and obviously (as a soup pea) they produce lots of seeds! So you should have no problem keeping back plenty to sow next year, as well as having a good crop for cooking. With all our rare peas, we recommend starting in modules to avoid losses to mice who will happily steal all your freshly planted valuable pea seed! The Latvian pea is again very productive and tall growing, so needs sturdy supports. It has really beautiful tan seeds speckled with a darker brown, obviously great for use in soups, but also good in other dishes that use dried pulses. Our friend Daniel makes a delicious 'hummus' with this variety. It also has pretty purple flowers which look very attractive in the garden. Again a smaller starter packet - but given a year or so you should be able to provide peas to most of your neighbourhood without much difficulty! A very ancient variety of peas originating in the Middle east, today cultivated in only in a few Appenine regions in Italy. Thanks also to its relatively problem-free cultivation this variety has been rediscovered in recent years and it did well for us in Wales in 2017. The plants are semi-dwarf - you can let them sprawl, but we'd suggest supporting them with pea sticks or low netting for the best crop. They are absolutely beautiful, with bi-coloured pink-purple flowers fading to pale pink/white as they age. They're allowed to mature and dried, then used for delicious winter soups and stews. Tasty and beautiful! An ancient variety that is still well worth growing. Mentioned by Linnaeus in 1741, this traditional soup pea is multipurpose - not just dried for soups, but also sweet enough to eat fresh, & also ground to make flour for bread and porridge. Grown in Rättvik until 1900, then thought lost until regenerated from a small sample in a seedbank. Peas don't in general cross very easily, so you can save seed from several varieties without worry. Here is our 'Golden Sweet' harvest. But be sure that you don't plant types with similar-coloured seeds next to each other, then you'll avoid any mix ups. Ideally pick your pea plants when they are fairly dry - we hang ours on an indoor washing line if it's persistently rainy! Then just stomp the peas out of their pods. More detailed seed-saving instructions are included with your seeds, so you can do all this yourself at home. Our Unique Structure: Although a limited company, we have no shareholders. The aim is not to make huge profits, but to supply great seeds to home gardeners at reasonable prices, and to educate people about home seed-saving. As part of our ethical policy, all staff are paid the same hourly wage, including the directors. Our Unique Guarantee:We have spent years trying to find the best varieties for you. We think these are the best seeds you can sow, and we really hope that you enjoy growing your vegetables. We will refund or replace if you are in any way less than delighted with them, even including the flavour of the resulting crop! Gardeners Should Save their Own Seed: Because these seeds are not hybrids, you can save your own seed for future use: there's no need to buy new each year. Saving your own is easy. You will get great seed, and great vegetables adapted to your local conditions. Do have a go - read the seedsaving instructions we provide with every order, and also on this site. Our Seed Club:Due to really daft seed laws, many of our fantastic vegetable seeds can only be supplied to members of our Seed Club, because they are not on the 'approved list' of permitted vegetable varieties! But membership costs just one penny. When you order, you will be charged a penny for a lifetimes Seed Club Membership. For details see terms and conditions.